MURFREESBORO, Tenn. — There were 2,238,575 votes in Tennessee’s 2018 gubernatorial election, but only 1.9 percent of those votes (42,165) were for independent candidates, according to the unofficial election results. This begs the question: why do independent candidates run? Sherry Clark was the independent candidate front-runner, who came in third place with 5,172 votes, or 0.23 percent of the total votes. “I ran as a libertarian to protest unfair ballot access laws. The Republican and Democratic candidates are protected by the laws they make as lawmakers, and they are able to suppress other candidates,” said Clark. “Tennessee requires 33,844 signatures to get a new party on the ballot, but only 25 signatures for any independent candidate to get on the ballot. The party petition is so difficult, it has existed since 1961 and has never been used, except in 1968 by the American Party. In order to illustrate how absurd it is for the state to require so many more signatures for a party than for an independent candidate, the Tennessee Libertarian Party has put 17 gubernatorial candidates on the November 2018 ballot,” wrote Richard Winger, editor of the Ballot Access News website, on the requirement based on the 2014 governor’s race. The 2018 governor’s election increased the number of signatures required to more than 55,900 signatures from now until the next governor’s election, making it even more difficult to be listed on the ballot with a party association. 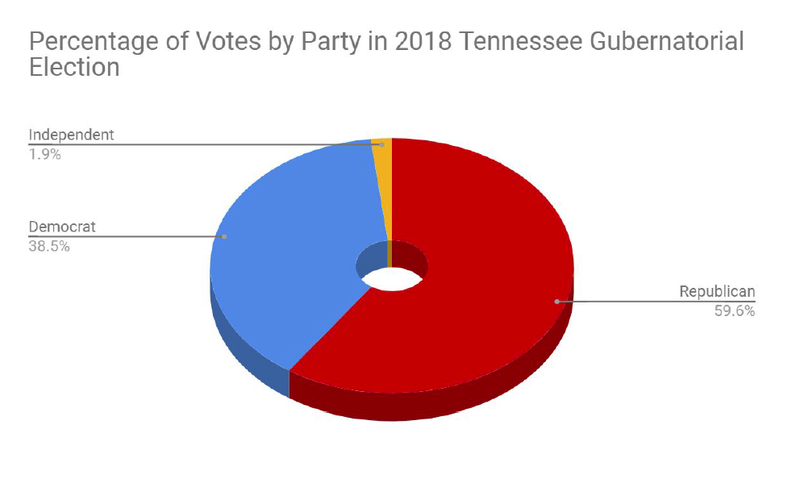 Tennessee’s current ballot access law maintains that if a party wants to be put on the ballot as a recognized minor party, they must collect signatures representing 2.5 percent of the total votes cast in the most recent governor's election. This is compared to states such as Mississippi and Florida, which have no requirement other than to submit the list of party officers. “It’s harmful to the citizens because it allows them to more easily be divided into two camps, and it’s easier to convince them to choose between two people that they don’t actually like,” said Justin Cornett, another independent candidate in the 2018 governor’s election and chair of the East Tennessee Libertarian Party. Clark explained that one of the major things that works against independent candidates is that they aren’t included in debates. Republicans won’t debate against independent candidates because they feel it weakens their party, which means that independent candidates receive very little media exposure. “I did not hear about any independent candidates. I didn’t see any media advertisements. The political ads were so heavy for Bill Lee and Karl Dean, and I felt that Bill Lee represented my values, so I did not look any further,” said a voter from Rutherford County. “Libertarians believe in the nonaggression principle. We don’t hurt people or take their stuff. Basically, we believe the government doesn’t have the right to force or coerce people just because they want to. It’s a different approach to government,” said Clark. For more information on ballot access laws, visit http://ballot-access.org/.